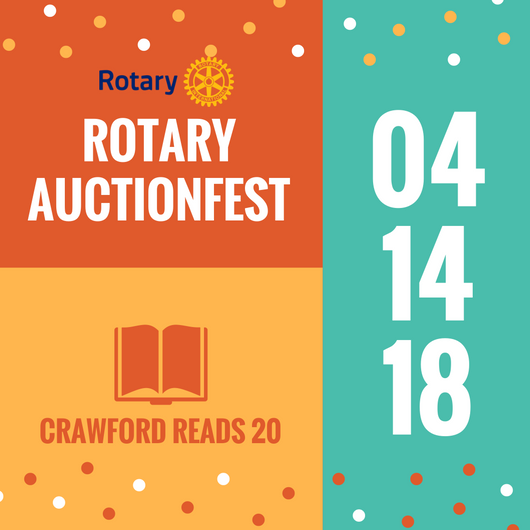 Fundraising Event for Rotary Projects and Crawford Reads 20. Sit down served dinner with silent and live auctions and entertainment. The $ 100.00 ticket includes a $ 50.00 voucher for purchases this evening. Our partner is the countywide initiative, Crawford Reads 20. This group is encouraging children and parents to read together starting at birth. Funds from the event will help make great children’s books available to every child in the county from birth to third grade. Contact any Rotarian, message Rotary’s FB page, or contact CR20 for ticket and donation information.